In moral and political philosophy, a social contract is the "explicit or tacit surrendering of some individual freedoms and submit to the authority of the ruler or magistrate in exchange for the protection of remaining rights". Many philosophers - Socrates, Thomas Hobbes, John Locke and Jean-Jacques Rousseau - were the proponents of Social Contract Theory. There are many criticisms of the theory. The primary being, the lack of willful consent by the governed. Maybe more significantly, the lack consent to "each and every rule or law" imposed by the state. I would add, the social contract inevitably leads to state corruption and exploitation, as the state is the sole "enforcer" of the contract. In other words, all states - even the so called democratic ones - have a tendency to centralize greater and greater power and abuse the social contract. And finally, there is no "termination clause", a fair way to get out of the social contract. So what happens when states "break all the rules", or rig the rules for the benefit of the few, as it is happening pretty much globally today. 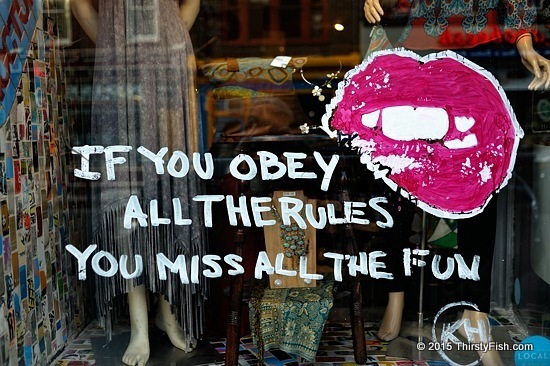 If you obey all the rules, not only would you miss all the fun, you won't have a fair contract by which you can live. Or, in the words of Thomas Jefferson: "The tree of liberty must be refreshed from time to time with the blood of patriots and tyrants".